The omnibus crime Bill C-10 is on its way back to the House of Commons for its final reading after a brief committee appearance last week. Since the Bill was introduced last September, a number of Canadians have expressed concern about the federal government’s “tough on crime” stance. They question why Canada would prioritize spending more now on crime, when crime rates are dropping. A 2009 Statistics Canada study shows the crime rate dropped 15% between 1998 and 2007, and that the severity of crime dropped even faster over that period, down 21%. Personally, I could be convinced that a “tough on crime” stance makes sense even when crime is in decline. But the question for me is: what do we mean by tough? We now are engaged in debate about numbers of jails and length of sentences; but I don’t think such measures necessarily get tough on crime. They do, however, reflect a growing tendency in Canada to wait for problems to occur, and then deal with the consequences after the fact. If we really mean to be tough on crime, why don’t we work hard at preventing it? Last week in a press release, federal Minister of Justice, Rob Nicholson, rightly said that “Canadians who have been the victim of a crime should not be re-victimized by the criminal justice system.” I agree. But we would treat the victims of crime with far more dignity by doing all we can to prevent crimes from occurring in the future, instead of working only to ensure that the criminal justice system works effectively to punish and rehabilitate. Research from UBC’s Human Early Learning Partnership (HELP) confirms this point. My colleagues and I have a unique opportunity to learn from kindergarten teachers in all school districts across the province what it means for a generation raising young kids to be squeezed for time at home, squeezed for income after the cost of housing, and squeezed for services like child care. One of the primary implications is that around 30 per cent of their kids arrive at kindergarten struggling to follow age-appropriate instructions, get along with peers, know 10 letters, or hold a pencil. Since the squeeze impacts an entire generation of parents, it turns out that most of the kids who struggle with these kinds of activities live in middle- and upper-income households and neighbourhoods. School achievement scores also let us follow the population of BC kids as they move from kindergarten to grade four, from grade four to grade seven, and from grade seven to graduation and/or into the criminal justice system. By examining the population of BC kids, we take a lot of the guessing out of research, which often relies on far smaller samples of kids to observe. Here’s what we’ve found and published in recent reports for the Business Council of BC, and the Canadian Journal of Public Health. 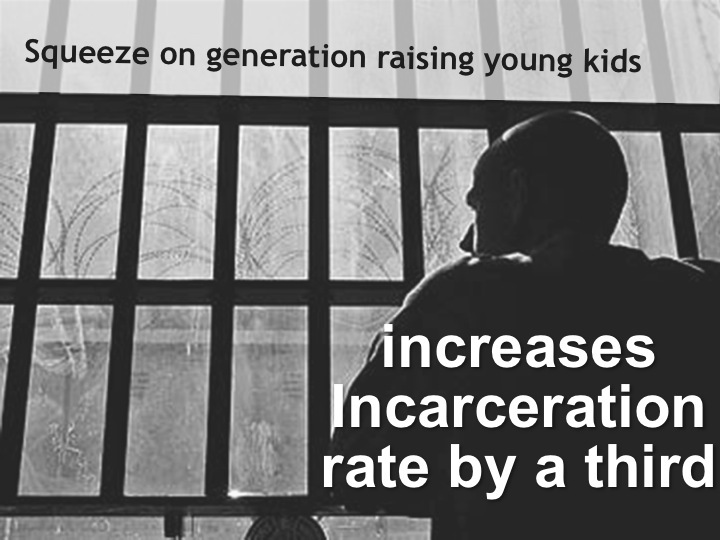 So long as we tolerate the squeeze on the generation raising young kids, we condemn their kids to far higher incarceration rates than they would have if there were a New Deal for Families in place. Specifically, policy investments that reduce the number of kindergarten kids who are vulnerable from 30 per cent to 10 per cent would reduce their crime rate as youth and young adults by ONE-THIRD. Now that would be tough on crime, and show real respect for victims by preventing so many of them from becoming victims in the first place! UBC researcher, Dr. Barry Forer, is examining the characteristics of kindergarten kids which predict later incarceration. His preliminary research points to simple social and emotional issues. Low self-confidence, inability to work independently or to complete work on time are social and emotional incompetencies that stand out as important predictors of later incarceration for both boys and girls. So are inattention, impulsiveness and difficulties making age-appropriate decisions. For many children, we could prevent these difficulties by remedying the time, income and service squeeze that plagues their parents. More parental time is part of a common sense solution to kids’ early vulnerabilities. This means addressing the socioeconomic realities that currently constrain time at home. Right now, parents work on average far more employment hours than did Canadian parents in the 1970s, but households don’t bring home more money to show for it – and what they do bring home has to stretch further to cover higher housing costs. As I have discussed in recent weeks, the New Deal for Families could help change this. New Mom and Dad benefits would increase the after-tax income of couples that split a year at home with their newborn by $15k. Thereafter we could support more parental time at home without a major hit on income through a combination of Flex-Time and $10/day child care services. The $10/day child care is a key way for the community to play a role in crime prevention. Such services provide early care and learning opportunities that supplement, but never replace, what parents do at home. Many analyses show one of the biggest paybacks for quality child care is through crime reduction. The potential savings from crime reduction in Canada are enormous. A 2011 study for the federal Department of Justice calculates that crime costs more than $99 billion a year: $17.4 billion in government costs for policing, the justice system, health care for victims, and victims services; and $82.1 billion in costs to society because of stolen and damaged property, lost productivity, pain and suffering, and loss of life. The New Deal for Families won’t reduce these costs much in the first few years, since 6, 7 and 8 year olds aren’t the most common criminals. But crimes are disproportionately committed by young people, with half the accused age 23 or younger. So it won’t take long for the savings to add up. Within eight years of reducing the vulnerability of Gen Squeeze’s kindergarten kids from 30 per cent to 10 per cent, a New Deal for Families will save Canadians $10 billion in crime costs. By the 14th year, we will be saving $10 billion annually, and the savings keep growing from there! Are Canadians weak on crime? Yes, so long as we have weak family policy.